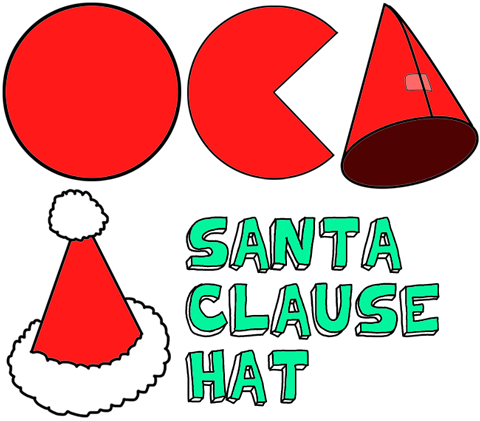 Santa hats are iconic to Christmas because everyone loves Santa Clause. It is fun to wear Santa hats when it is getting close to Christmas as it gets you into the festive mood. It is also fun to decorate the tree with Santa hat ornaments or to make cookies in that festive shape. There are many ideas that you can try out...below are some inpirational ideas. You could make any size Santa Clause hat with this craft....the bigger the size of your paper, the bigger your hat will be. So you could even make tiny Christmas hats for table place holders. Use a bowl to trace a circle on a piece of paper. Then cut a triangle slice out of it. Then roll it into a cone and tape shut. Then take cotton balls and glue them all along the bottom edge. Glue at the top of the Santa hat too. 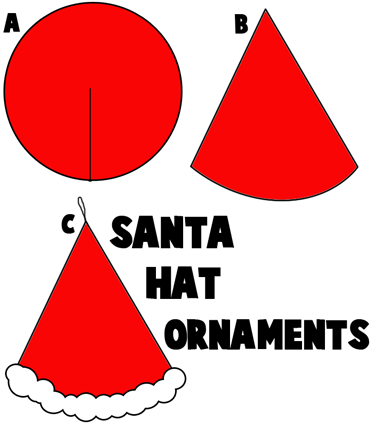 Here is a simple Santa Clause Hat craft. How about making little hats as Christmas tree ornaments? Cut out a red circle and then cut a slit up to the center of the circle, as seen in illustration A above. Then paste it into a cone, as seen in illustration B above. Push a string thru and tie a loop. Then paste cotton all along the bottom of the cone. You now have a cute little Santa hat to hang on your tree. Foldable Paper Santa Clause Hat - This paper craft is to fold up a paper Santa and a hat to put on top of his head. But if you want only the hat...you can just do that part instead.